Islam a Religion of Peace? Why the Silence? Islam a religion of peace? 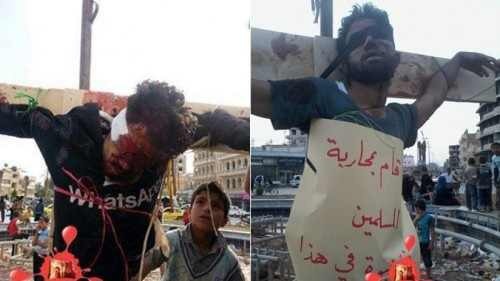 Is so, where are American Muslims protesting and speaking out against genocide of Christians by ISIS Muslims in Iraq? Children beheaded, women raped, Christians slaughtered as animals, many starving as they flee the terror and Muslims are saying nothing. Are they sending money and supplies? Why the silence? Will prominent Muslims and politicians speak out against this? Wake up America! VATICAN CITY, August 11, 2014 (Zenit.org) – The Chaldean Patriarch of Babylon has highlighted the extent of the refugee situation in northern Iraq, warned of “escalating” humanitarian needs, and said the hardships facing Iraqis should stir consciences into action. The situation facing Iraqi Christians has deteriorated as the forces of Islamic State (IS) have expanded across the Nineveh Plain. In July, the terrorist group issued an ultimatum demanding Christians convert, pay an “infidel” tax or be killed. Thousands of Iraqi faithful fled Mosul, Iraq’s second largest city. In his statement, Patriarch Sako decried how children and elderly in the region are sick and dying, along with the thousands of refugee families spread over the Kurdistan Region who lost everything. As IS militants are still advancing, humanitarian aid is insufficient, he claimed. 70,000 displaced Christians and other religious minorities have fled to Ankawa, a suburb of Erbil, where they are seeking refuge in churches, schools or living in “deplorable” conditions on the streets and public parks. As humanitarian needs escalate, the Chaldean Patriarch criticized the international coordination as slow and therefore limiting the effectiveness of helping thousands awaiting immediate support. Although the churches are doing all they can, he said more must be done by others. President Obama’s decision to only give military assistance to protect Erbil “is disappointing,” he said, as they are not going to attack the IS in Mosul and in the Nineveh Plain. Although Obama has said he is interested in preventing the Islamist militants from establishing a caliphate in Iraq, many await concrete military and humanitarian action. Despite an increasing number of US air strikes, many claim the operation is insufficient to destroy Islamist extremist forces. Patriarch Sako also criticised the Iraqi government. “While the country is under fire, the politicians in Baghdad are fighting for power,” he said. The BBC reported that Iraqi Prime Minister Nouri Maliki has been criticized for sectarian policies. His push to serve a third term is also adding to tension. The Patriarch expressed concern that “in the end, perhaps Mosul will not be liberated neither the villages in the Nineveh Plain,” as other Islamic extremists continue to join IS from around the world. The choice of the refugee families, he said, is either to migrate or to stay. If they migrate, he asked, “do they have the necessary documents and money?” If they stay, he wondered what their fate will really be, whether their schools will be reopened, and if they will be able to retain their property, jobs and belongings. He closed by calling on all people and organizations to reflect on these questions and to take action to help the Iraqi people.